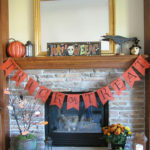 Add this easy DIY Trick or Treat Halloween Banner to your home decor for less than $4! 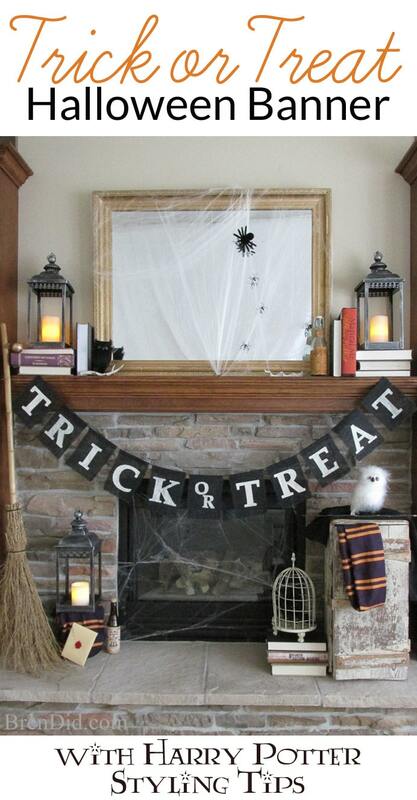 It's perfect for a magical Halloween party. 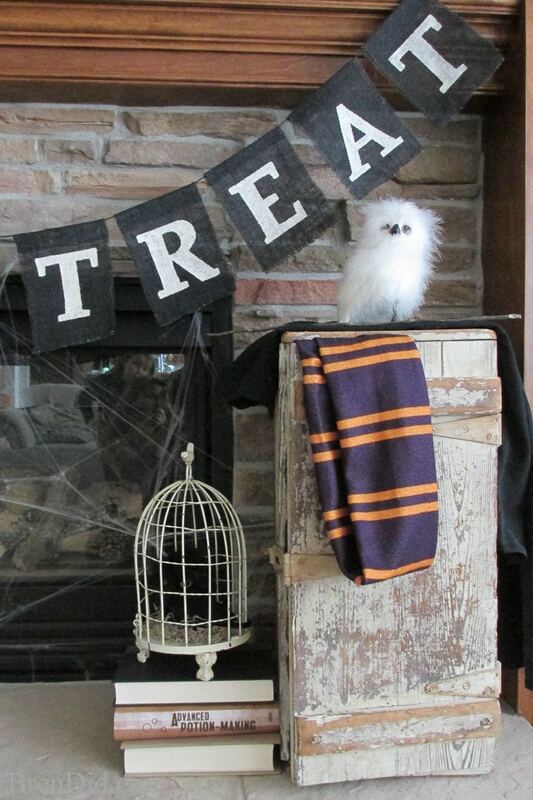 Plus check out my tips for adding Harry Potter Inspired touches to Halloween decorations. 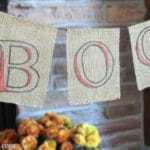 I am crazy for all things burlap & twine! 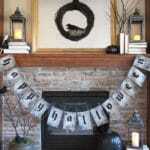 Add this to my love of seasonal banners on the mantle and you can see why I love this Pottery Barn style banner. Then the banner’s lovely cry was drowned out by the price tag of $24.50. 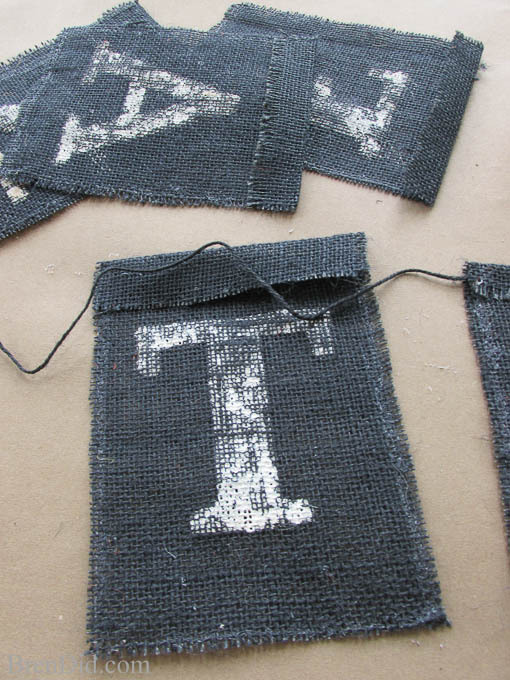 Since the original banner was made of jute (a fancy catalog way of saying burlap) I knew it could be made for CHEAP: burlap is around $4 a yard, acrylic paint is less than a dollar a tube, and twine is around $0.10 a foot. Use a Silhouette machine to cut the vinyl for you. Get the free cut files. 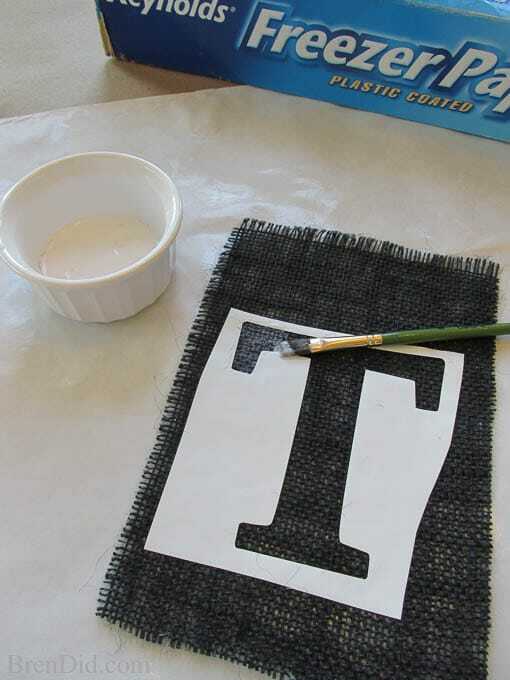 Creates a base layer for your paint (so you get a nice crisp edge on the lettering) using Modge Podge or a mixture of 2/3 school glue and 1/3 water (I use glue and water). Work from the edge of the stencil inward to prevent the glue from leaking under your stencil. 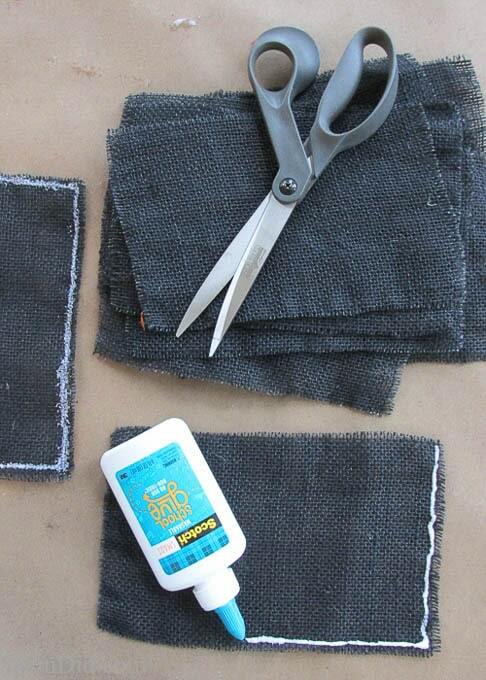 Allow the glue dry for at least an hour. 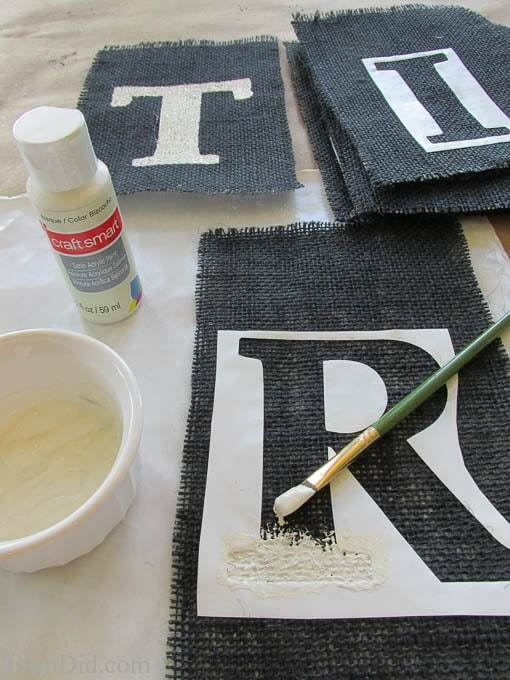 Use acrylic paint and a small brush to stencil the letter onto the burlap using cream acrylic paint. Work from the edge of the stencil inward to prevent the paint from being forced under your stencil. Allow the paint dry for a few minutes then remove the stencils. (I let the insides of the letters dry a bit longer to keep from creating smudges.) Use a toothpick to make them easier to remove. 6. Cut the twin to hang the pendants. The finished PB banner is 77 inches long, but I use a 9 foot piece of twine so I have extra length at each end to hang the banner. 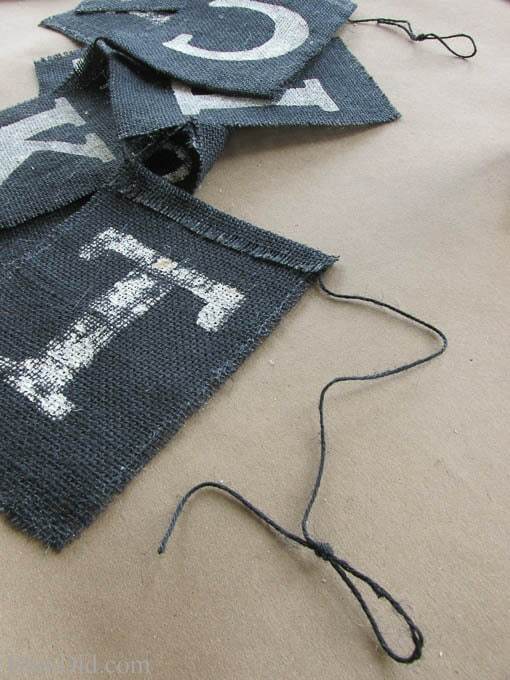 If you want a shorter banner use an 8 foot piece of twine, the ends will have a loop that takes up several inches. 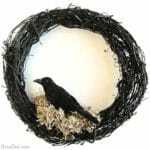 Use a glue gun to attach the dry pennants to the twine. (Tip: use an iron to crease the pennants ½ inch from the top. This makes a straight line to guide the glue and twine placement. )Space each pennant 1/2 inch apart. Leave 1 inch between words. 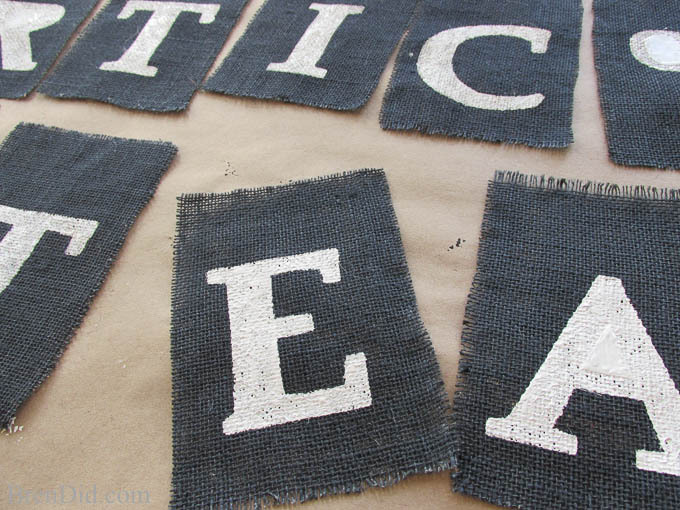 (Tip: start attaching letters to the middle of the twine and work out to ensures the banner is centered.) Knot the twine at the end to make a hanger. 8. Enjoy your new creation! I love the Trick or Treat Halloween banner and the SAVINGS! 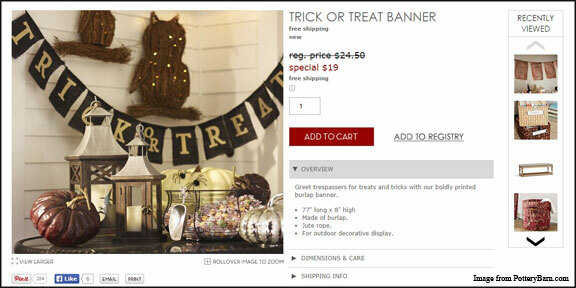 The Pottery Barn price is $24.50, mine was about 85% off…. $3.75! 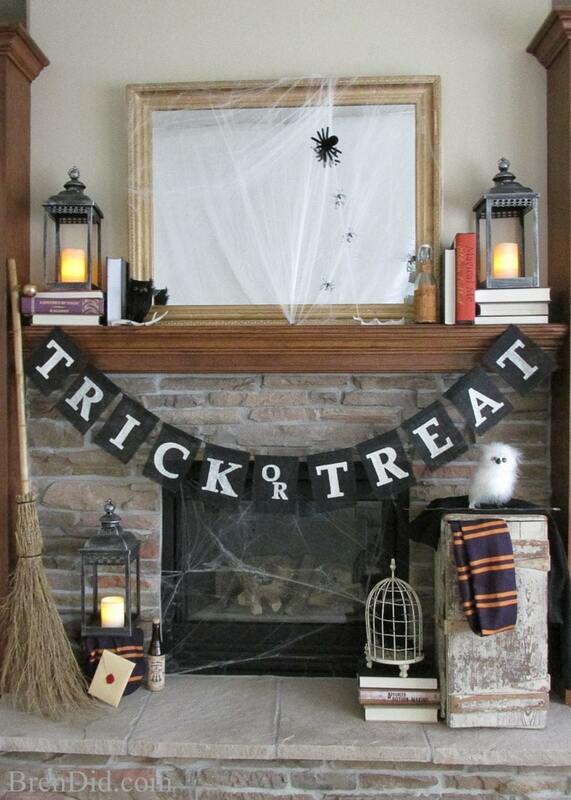 I'm crazy for all things Harry Potter so I added some magical touches to to my Halloween mantle. 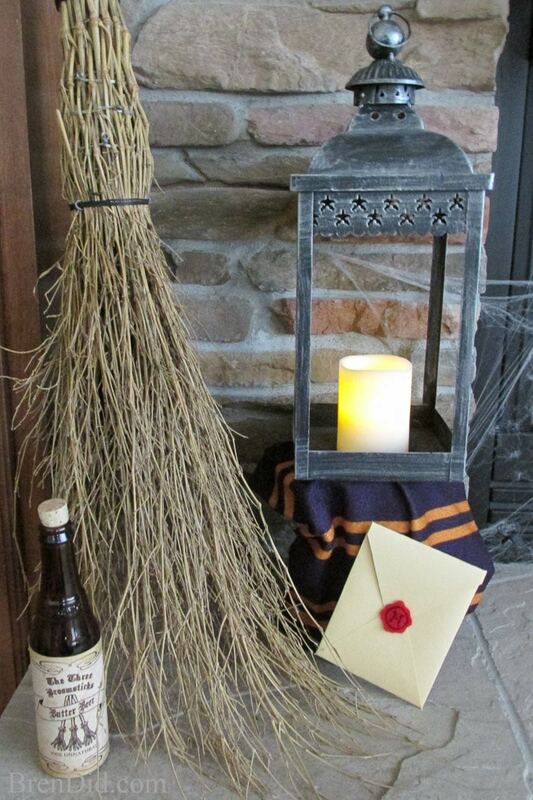 An invitation to Hogwarts. Folded cream parchment into an envelope shape and cut a “wax” seal from a piece of felt. Draw the “H” on with a permanent marker. Nimbus 2000. (I’m old school in my broom tastes, you can also use a Firebolt or a Cleansweep). 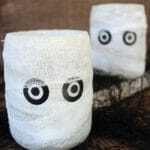 Buy a twig gardening broom on Etsy or grab a broom at a Halloween costume shop. Butterbeer. These free printable labels from Confetti Prints are so adorable when glued to brown glass bottles. I stuck in a piece of wine cork to make it look unopened. Candles. Use flameless candlesas the decorations tend to attract little folks! Owls and more owls! 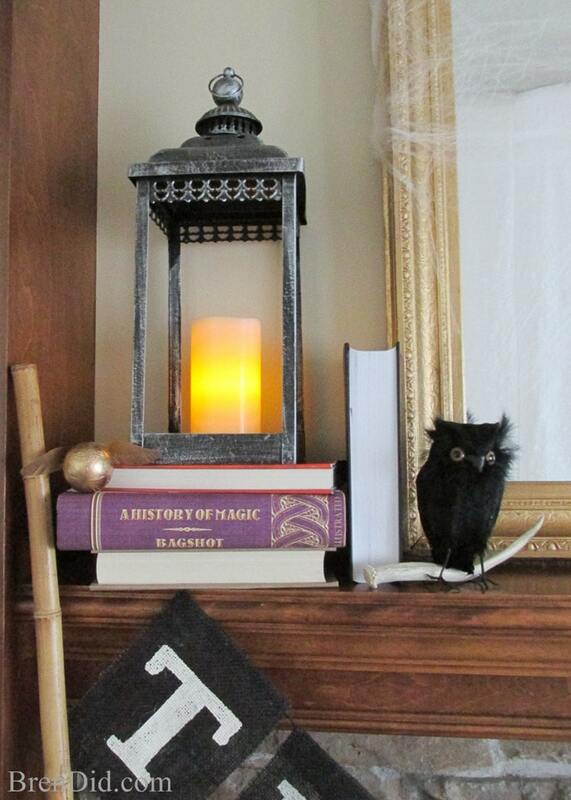 A few fake owls set the scene: there is a snowy white Hedwig, a black owl we’ll call Hermes (a nod to our favorite family the Weasely’s), and a little black owl in the cage (we’re calling him Owl-bert Einstein due to his unfortunate feather styling). An Owl Cage. This lovely bird cage came from Michael's a few years ago, they have other similar styles. A Gryffindor Scarf and Robe. These are leftovers from a Harry Potter Halloween costume. 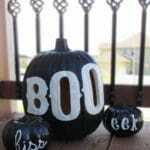 Again, try a Halloween store or just use fabric. A Trunk. No Hogwarts student would show up at Platform 9 ¾ with a suitcase! If you don't have a trunk use a plastic cauldron. A Huge Mirror. Mine looks pretty ancient, we’ll call it the Mirror of Erised. A Big Spider . Add one large spider (a young Aragog, perhaps?) and some little ones to the mirror with cobwebs. They’re fleeing the basilisk! The big spider is from Michaels, the little ones I cut from spider rings I bought at the Dollar Tree. The cobwebs are also from the Dollar Tree. 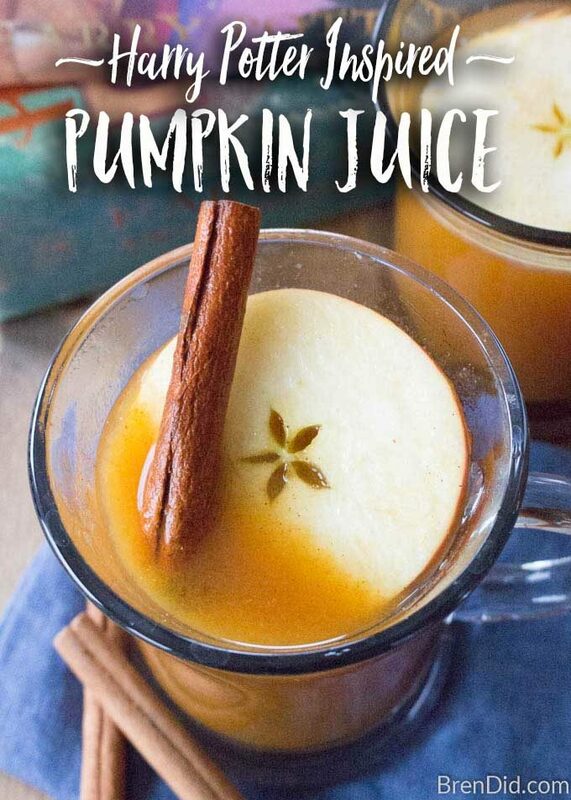 Pumpkin Juice. Print this free label and attach it to a bottle. I used a bottle with a wire bail lid, I love the old-fashioned look. A Unicorn Horn. Place several sea shells together (beside the pumpkin juice). The Golden Snitch. Made from a rubber ball with some thin plastic wings (cut from a recycled food container) attached with super glue then spray painted gold. Lanterns. You can't explore the Forbidden Forest without a trust lantern! I also added an antler I found on a hike as an owl perch. I like the rustic/creepy element it adds. Magical School Books. Print some great spines at the Hideous! Dreadful! Stinky! craft blog. I wrapped a few other books in brown craft paper and added a few books with colorful cover edges. 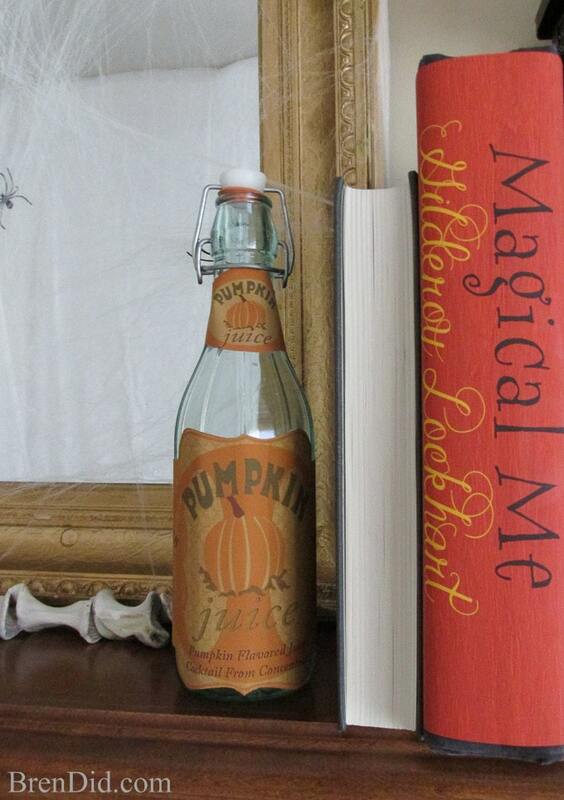 Harry Potter Inspired Pumpkin Juice – This warm, tasty cider is made with real pumpkin and no refined sugar. 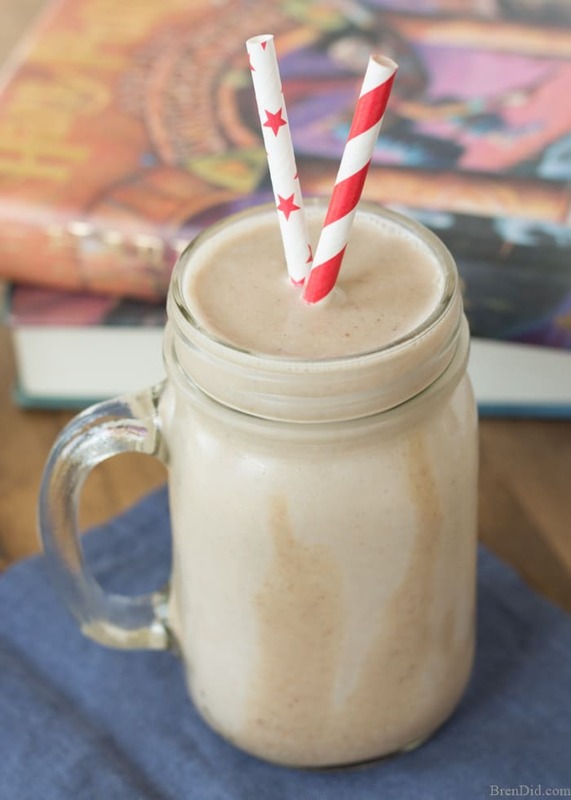 Healthy Butterbeer Smoothie – Kids love these butterbeer smoothies made with fruit and dates. Bonus: they contain no sugar or dairy! 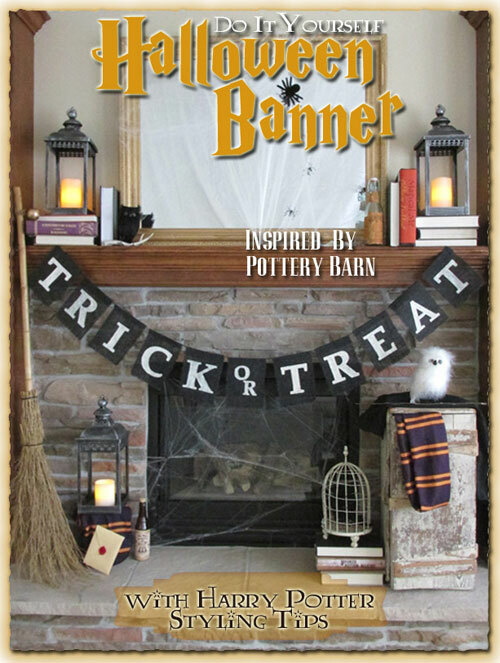 I hope you try making a Pottery Barn Inspired Trick or Treat Banner or one of my other knock-off decorations this Halloween!